﻿ E-ink-Reader. THE REVIEW OF ELECTRONIC BOOKS WEXLER. The Russian company WEXLER lets out devices under the mark with the same name. These e-book readers are easy-to-work and comprehensible at the price, at the same time have a number of necessary functions. All models arriving today on counters of shops have the six-inch screen and the plastic case. Model E-5001 - the most simple and inexpensive model in a ruler. The price of the electronic book recommended by the manufacturer, makes about 75 euro. Keys of browsing of pages are only on the joystick located under the screen, and it is not so convenient. Screen type - E-ink Vizplex. It is the most simple model, capable to meet the basic desires of users. Model E-6001 - more difficult and expensive model. For a choice of the necessary file there is a line of the numberic keys located to the left of the screen. The browsing key forward is added, but its arrangement became absolutely unsuccessful - on the right below. Screen type - E-ink Vizplex. Model E-6002 - with screen E-ink Pearl. Numberic keys have moved and take place to the right of the screen. In this model there is no separate key of browsing forward, navigation functions under the book are assigned to the joystick which became a bit convex. In the rest the reader differs from model E-6001 a little. Model E-6003 - with screen E-ink Pearl HD the permission 758х1024 points. In the device support of all basic formats of text documents, except for files MOBI is realised. The case is executed from plastic with a covering soft touch. Browsing keys remained only on the joystick that is not always confortable. Model E-6005 - only-that the gone on sale device with screen E-ink Pearl HD and an operating system Android. Model WEXLER FLEX ONE it is so unusual that we result its photos separately. 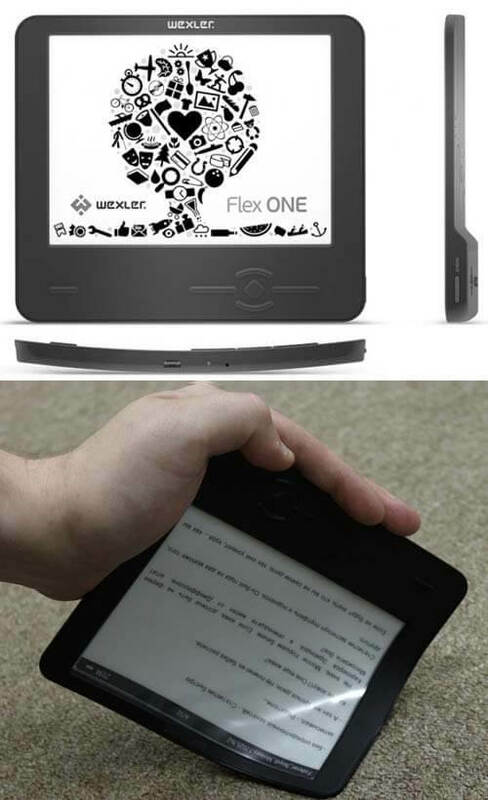 This electronic book is executed with application of the flexible shock-resistant screen E-ink Flex developed by company LG. Feature E-ink Flex is replacement of a glass substrate on polymeric therefore the screen becomes flexible and not so strongly is afraid of blows and deformations, as usual e-ink displays. This type of the screen in the readers already was used by companies Nippon Klick Co. (Digma) and Gmini Co. (Gmini magic book). Design at these electronic books quite traditional, is reported only about the raised crash-worthiness of the screen. WEXLER has made the book, first, a little bent under the form, secondly, has executed it from a soft polymeric material that allows to bend the device display. Therefore the battery, a SD-card, the keyboard and all electronics it is concentrated in thickened the basis of the case located under the screen. It has not allowed to supply the book with the capacious battery, and many owners of the device complain of its very small resource. In the rest, the book is simple enough, in it has not appeared neither carryings over in texts, nor supports of dictionaries, not supprrt useful applications. Advantages of a design and equipment: Presence of the slot for SD-card, a cover and the power unit in the equipment. Design and equipment flaws: In a modelling number there are no readers with the five-inch screen. Advantages of the software: Support of a considerable quantity of formats. Software flaws:Very small set of options, there are no applications, there is no possibility of loading of fonts, there are no carryings over to texts, on a bookshelf names of books are not displayed. Selection of resources of the Internet about e-book readers Wexler is in section "Links."